"Bienvenidos a la Dominicana!" 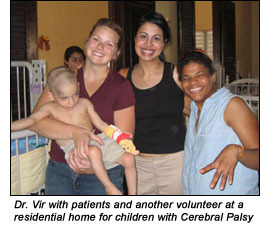 I was welcomed with the warm greeting and a kiss on each cheek by the man holding up the sign that said Doctora Vir. I would later find out that he was the director of ILAC, Radalme. As our small SUV sped through the highways I gazed out over the fields of banana, palm, and pineapple trees, the mid-day sun already inviting me to peel off my coat and cardigan. I could only wonder which adventure lay ahead for me during my stay in the Dominican Republic. I was a third year Family Practice resident, working in New Jersey. The years of long hours and sleepless nights had started to get to me. I had planned to use my month -long away elective time to go to the Caribbean and work in an underserved community. With winter in full force, February seemed like an ideal time to leave New Jersey for the balmy islands. I made arrangements to work with the Institution for Latin American Concern (ILAC), a mission organization whose primary goal was to understand and serve extreme poverty in Latin communities. Even though I worked with a large Latino population, most of whom did not have the income for health insurance, I felt I had more to learn about their culture, the health care available to them in their homelands, and maybe other ways to provide health care for them. After arriving at the ILAC center and being given a tour of the sprawling mission grounds,I was introduced to the entire staff of ILAC including the secretaries, drivers, cooks, and even the priest. Shortly before dinner, the Americans began to filter in. I met a large group of undergraduate students who lived in the D.R. as part of a semester abroad program. I was also introduced to a group of medical students and residents who were working in local hospitals and clinics and spending time with the families in the campos. Among them were OB/Gyn students who were learning to listen to fetal heartbeats without Dopplers, comfort and deliver the babies of women in labor without epidurals, and deal with the harsh realities of prejudiced treatment among the Dominicans and the Haitian patients. I trekked through the country with all of them, spending time shoveling cement to lay a new home foundation with the undergrad students in the hills of Arroyo del Torro on occasion, and seeing patients in the clinics with the medical students and residents. 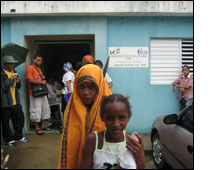 I'll never forget El dia de los Enfermos, the Day of the Sick, when we all attended a large mass at a church next to the clinic in Comedero (pictured on the left), a campo. All of the medical personnel were called to the front of the church for a special thanks and the doctors were then requested to take part in blessing each of the twenty elderly men and women in the front row of the church. I was startled to realize that they wanted me to simply lay my hand somewhere upon them while the priest read a prayer, to feel that they had been blessed. As the patients began lining up in the clinic after mass, I was again humbled by their appreciation to even be seen by a physician. Most of them had simple complaints of low back pain and aching joints, but my mere advice for rest and the occasional NSAID was greeted with an overwhelming display of gratitude. During the three weeks that I was in D.R. I sensed a weight being lifted off of my shoulders, and I realized that I felt happy again, happy to see patients, happy to be a physician. The joy in the people of this beautiful island was contagious. Most of them lived in extreme poverty and worked well into their senior years-laborious, back-breaking work. And yet, there was peace in their faces, tanned and weathered by years under the sun, and a brilliance in their smiles that no amount of teeth-whitening could ever replicate. The day I left, I was sent off with bouquets of flowers and thank-you cards and letters both from the staff of ILAC and the clinics I had visited. I bade a tearful good-bye to all of my newly found friends and promised to return soon-a promise I know that I will keep. The experience with ILAC and the people of the Dominican Republic has changed me for the better and forever.